Get all of your classroom hours for Basic Certification in this Intensive! This contains two 5-Day Basic Courses, for 75 hours total! 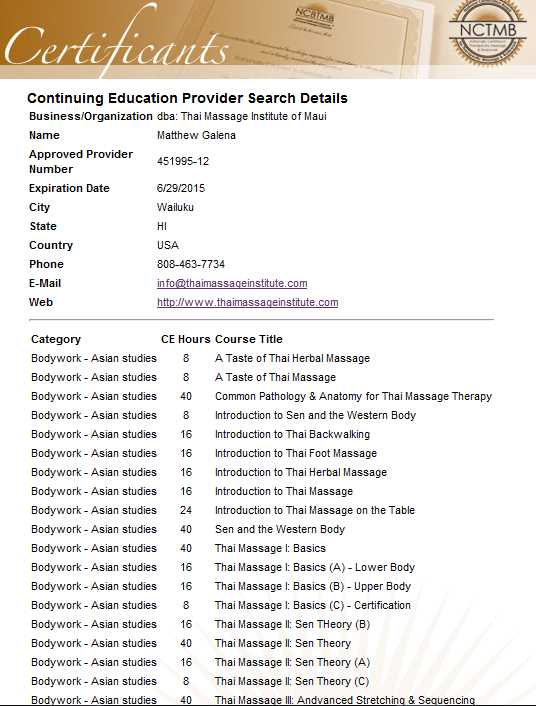 More information is available on the page for Thai Massage I: Basics. During this 35-Hour basic skills improvement course, students will practice the full basic learning routine each day under guided supervision, focusing on proper form for the practitioner, with refinement and variations for material previously learned in the prerequisite 40-hour basic training, Thai Massage I: Basics. More information is available on the page for Body Mechanics & Refinement. No Class on Saturday, but we will reconvene Sunday morning for Part 2! This course includes Body Mechanics & Refinement as an intensive 20 hours of guided, real-time practice focusing on form, flow, transitions and basic variations, plus another 15 hours of supervised practice and practical examination! After the first 5 days, students will get a full day of rest on Saturday. On Sunday, everyone returns for a morning half-day, being led through the full massage routine by the instructor. Each student gives and receives one massage, before breaking at 2:00pm, and taking the rest of the day off. Monday and Tuesday are both intensive 8-hour days, with each student giving and receiving a full-length massage before and after the lunch break. The last two days are intended for supervised, unguided practice. While these sessions are supervised, students work in their own time, without constant guidance by the instructor. Students are expected to rely on their memories and workbooks to perform the basic routine, with intervention and adjustments by the instructor in the time of need. To be granted Basic Certification, you must safely and satisfactorily perform the routine by memory (within reasonable error, and without use of the workbook), and pass a brief, basic written test on Thai massage history, principles and theory. Starts on Monday, ends Thursday the following week.